Since it’s summer, I’m channeling my inner Julia Child/ Barefoot Contessa/ Miley Cyrus to throw a refined yet fun dinner party. The mark of a great dinner party is being able to enjoy it yourself. You can do a lot ahead of time to keep things simple the day-of. 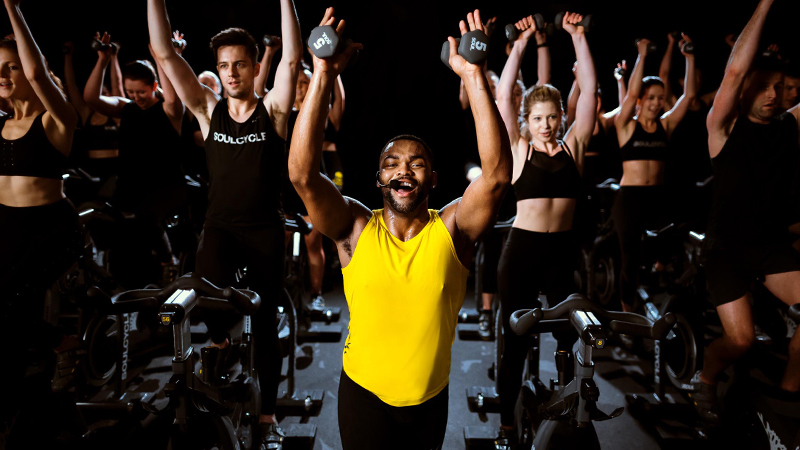 For a recent party, I made everyone take my SoulCycle class before they came to dinner because, DUH! And here's what else I did. Use these tips to throw your own summer soiree! 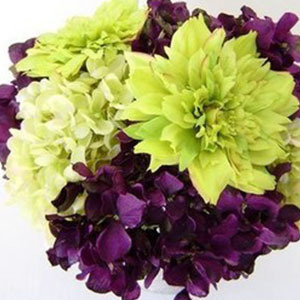 Buy them the day before so they have time to fully blossom once you make an arrangement. The best way to approach flower arranging is to treat it like a painting: Choose a palette of complementary colors, pick a focal point for the eye, and fill in the negative space with greenery or filler flowers. For this party, I wanted to do something simple so I just took a bunch of green/white clean, fragrant, and ready-to-party flowers. While I have my favorite remixed jams to ride to in class, my taste in music for a dinner party is pretty different. For this party I wanted to go for a funky electric vibe so I found a library of single releases from Stax recording studio. In the late 1950s to 1960s, Stax Records was a Memphis-based record studio. It’s a library full of blues, funk and jazz. Sorry, kids: No Madonna tonight. 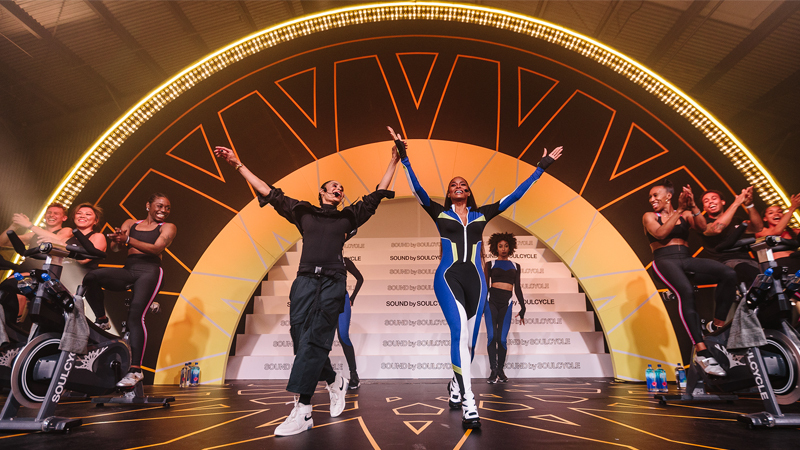 The main focus should be to find music that is lively enough to keep the party going without distracting from conversation. I was a bartender for a minute when I first moved to New York City so I pride myself in crafting a delicious cocktail. I think it’s nice to have one drink that sets the tone for the evening. I wanted the party to be refined yet wild so I went for a forgotten rebellious cocktail of the Prohibition era called The Blue Moon. It has a complex flavor with a sour finish that’s perfect for revving up an appetite. 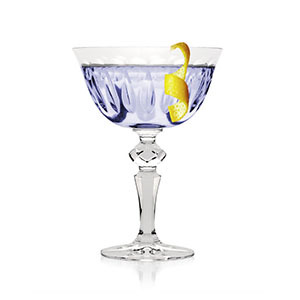 Simply shake together 2 ounces of gin, ½ ounce of crème de violette and ½ ounce of fresh lemon juice. Cheers! Salty: Spelt pretzels and champagne dill mustard. You can dress up a simple snack just by experimenting with variations. The pretzels are organic and the mustard is fancy. Sweet + Savory: I wrapped some dates in prosciutto to combine these two complementary flavors. That way, while there’s party going on around you, there’s a party going on in your mouth, too. Sour: Cornichons (those weird little pickles) because they also pair well with the mustard and pretzels. Also, I like to feel like a giant when I hold them. I wanted to make food that was light and fresh. 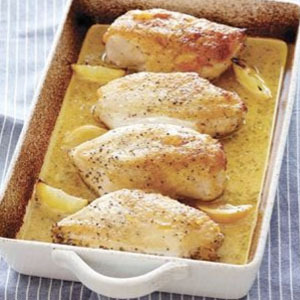 I decided on a roast lemon chicken (for vegetarian partiers, you could roast summer squash instead). Prep is super simple: You just sauté some garlic for literally ONE minute and then add in some flavors (oregano, thyme, lemon zest) and white wine. Take that base liquid and pour it over four chicken breasts. Dress the roast with some lemon wedges for flavor and color, then roast at 400° for 30 to 40 minutes until the skin is browned. High in flavor. Low in fat. Aside from the chicken, I wanted to keep things simple: Don’t slave away in the kitchen all night. Throw the chicken in and put some broccoli florets in a steamer on the stove then go enjoy your guests! What says party-time better than champagne for dessert!? 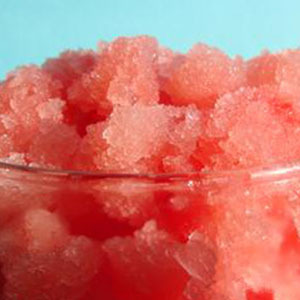 The best dessert for after-summer meals is a watermelon/champagne granita. It has only three ingredients: watermelon, sugar and champagne. BUT… save the Veuve for toasting because you’ll be sweetening the mix with sugar so the champagne doesn’t need to stand alone in quality. Place cubed watermelon and sugar in a blender and blend for a minute. Add champagne then pour the watermelon mixture into a plastic container, cover and place in the freezer. Stir the mixture with a fork every 30 minutes until frozen, about 2 hours. Before serving, remove the frozen granita from the freezer and stir using a fork or pop it in a food processor and pulse until it reaches the consistency you want. Then serve in glasses garnished with watermelon slices. 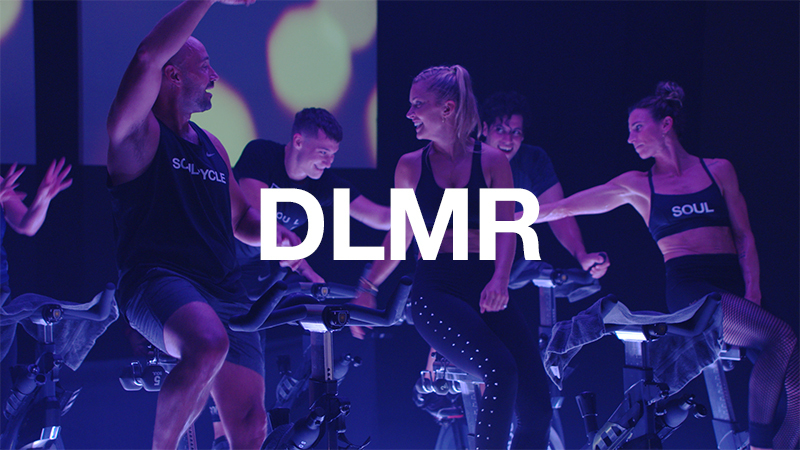 Above all, it’s important to relax and let the party breathe (just like in a SoulCycle class). Do the work, but choose to have a party you can manage easily so the work doesn’t overshadow the fun. Give yourself a break and make sure the party is just as much for you as it is for your guests! Quality summer nights are some of the best nights of the year so invite people you want to make memories with. Oh, and I’m available most Thursday nights and I’ll be accepting invitations via Twitter @drewbiejames! 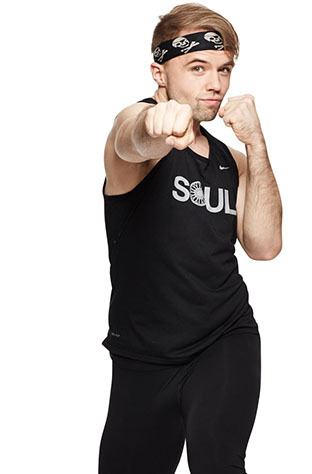 Catch Drew's classes at Soul 19th Street, Soul Greenwich, Soul Union Square and Soul Williamsburg! Questions or comments? Email blog@soul-cycle.com!